If you follow our blog, you know that we are huge advocates for proper maintenance and preventative measures when it comes to protecting your biggest investment - your home and its roof. Your gutter system is a huge part of a properly functioning roof, and it should be inspected and maintained much like your roofing system. 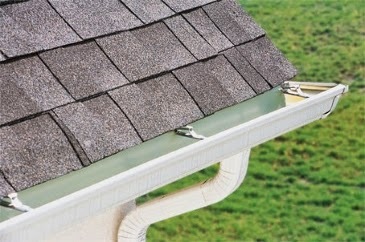 Gutter problems can lead to poor drainage, costly interior leaks and foundation breakdown. Let’s take a look at a couple of most common problems you may find as you’re inspecting and maintaining your gutters. #1. The Problem: Sagging Gutters. Over time, the fasteners and brackets holding your gutters against the roof perimeter may begin to pull away—or even break off—so gutters begin to sag. In addition to being an eyesore, this sagging allows debris and sludge to build up in the center of lengthy gutter sections. Sagging gutters don’t drain as well, and sludge causes gutter deterioration over time. The Repair: Reseating or Replacing Hangers. If your gutters are held in place by spike-and-ferrule hangers, try caulking around the spike and allowing caulking to cure. Then, drive the long spike deeper into the roof’s edge. If the spike does not “grab” solid wood when you drive it, change out the spike for a larger nail or a longer wood screw. For clip-style gutter hangers, you must pull up the edge of the roof and reattach hangers to the underlay, or “sheathing.” Be gentle with the roofing material, or you may crack shingles and cause additional roof damage. #2. The Problem: Popped Rivets. If your home is protected by aluminum gutters, they’re probably attached to one another by rivets or small screws and further secured with roofing sealant or silicone caulking. As gutters shift and warp due to water weight, wind and age, rivets and screws may pop loose. Caulking also dries out over time, losing its ability to support gutter joints. The Solution: Reinstalling Rivets. After climbing safely up to the roof’s edge, grasp the two loose gutter sections and place them together. Using a lightweight electric drill, make a small hole through each side of the gutter or downspout. Set pop rivets in each drilled hole, and use a pop rivet tool (available at most hardware stores) to secure the rivet into place. Apply a thin layer of roofing cement or exterior silicone caulking around the edge of the repaired gutter, and allow it to cure for 24 hours before testing the integrity of the connection. You may need to reapply a second layer of roof caulking to ensure a tight seal. If you ever feel unsure or unsafe about performing any of these DIY fixes for your damaged gutters, don't hesitate to contact Trudel and Sons Roofing at (905)642-3515 and we'll be more than happy to send a pro your way to fix the problem! Labels: blog, DIY, gutters, professional, repair, roof, roofer, seasonal, tips.